This is a two for one deal. There is an alligator clip on the daisy and a French clip on the bow, the clip just slides right onto the flat center of the base bow. 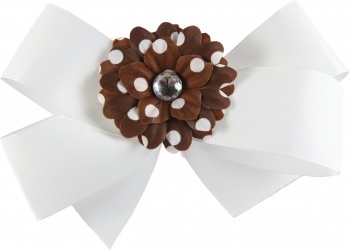 This is a bright white grosgrain ribbon in a boutique style bow that is topped with a brown daisy that has white polka dots all over. The center of the daisy is a white gemstone that catches the light.